Japan attacks Pearl Harbor – Why? As I have said before, history is a l-o-n-g, s-l-o-w b-u-r-n. I’m quite certain that when news broke out on that Sunday morning in December, most Americans were shocked and stunned. The news was presented as “a sneak attack,” an “unprovoked act” and the like. Well, that is certainly one way to look at it. Like the attacks of 9-11, it was a singularly horrible and shocking event. But whether we like it or not, as with all “acts of history,” there is context to be reckoned with – the great fabric of history is woven from many, many threads. Some of the threads are short and colorful, most are long strands, covering the back of the whole tapestry. Bland strings, holding the whole thing together. The lead-ups to WWII are most of the threads of the WWI tapestry (the Great War to End all Wars), with a few colorful bits thrown in. In order to “understand” the Second World War, we must look at the 1920’s and 1930’s in America. Why America? Because that’s where we live. America played a part in both Wars, and there is a rich historical tapestry to look at. The 20’s and 30’s were fascinating! The Roarin’ 20’s. Prohibition. Isolationism. A decade long drought. The global stock market crash. Changes in Presidents and policies. These are just a few of the threads that connect the World Wars. Over the next several posts, we’ll take a peek at a few of these things. Having said that, I’m going to immediately ignore it all and start the conversation with an event that happened in 1898 in Cuba. 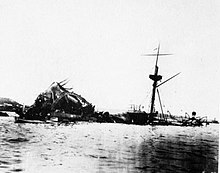 During the night of February 15, 1898, the brand-new battleship, USS Maine, anchored in the Havana Harbor, suddenly blew up and sank, taking 3/4’s of her crew down to the bottom with her. Wreckage of USS Maine, 1898 (wikipedia) Does this remind you of Pearl Harbor? Yellow journalism was a style of newspaper reporting that emphasized sensationalism over facts. During its heyday in the late 19th century it was one of many factors that helped push the United States and Spain into war in Cuba and the Philippines, leading to the acquisition of overseas territory by the United States. The “yellow press,” lead by saber-rattlers William Hearst (San Francisco) and Joseph Pulitzer (New York) (yes, THAT Pulitzer – ironic, no?) pushed that Spain was responsible for detonating a mine under the ship. They lead campaigns (Remember the Maine, and such) to egg us on into a war with Spain. There never was direct evidence of a bomb; studies over time have concluded it was most likely gas from the coal burners that ignited and touched off the armaments stored in the ship. The upshot is, under the guise of supporting Cuban Independence and the “Spanish sinking of the Maine,” we declared War on Spain less than a month later (April 25, 1898). Four months later, Spain and the U.S. signed the Treaty of Paris, which granted Independence to Cuba, and awarded Guam and Puerto Rico to the U.S. Spain agreed to sell us the Philippines for $20 million . . Some threads in the tapestry. (Ahem . . .) history is FULL of ironies. Fifty years later, how did we feel about Castro and Guevara and their quest for Cuban Independence??? More peeks at the WHY of Pearl Harbor to come.